'Esophageal varices' is a medical term used for describing abnormal, swollen veins in the lower part of the Esophagus --- the tube connecting the throat and the stomach. The occurrence of Esophageal varices is mostly associated with serious/advanced liver diseases. Esophageal varices can be described as a condition of extremely dilated sub-mucosal portal veins (the veins supplying blood to the liver) in the lower portion of the Esophagus. These veins become abnormally enlarged due to the blockage of normal blood flow to the liver because of a clot or scar tissue in the liver. As a result of the blockage, the blood flows into smaller blood vessels (including vessels in the esophagus) which surround the varices but do not have the capability to carry large amounts of blood. 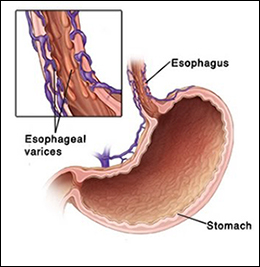 Esophageal varices can potentially trigger life-threatening bleeding if they rupture or leak blood. The risk of bleeding in people suffering from Esophageal varices increases due to 'portal hypertension' -- that is, excessive pressure of blood in the portal veins -- which commonly occurs in case of Cirrhosis or other severe liver conditions. Besides liver diseases, portal hypertension can also occur in a condition called portal vein thrombosis, in which blood clots are formed inside the portal veins. Generally, the chances of bleeding are higher if varices are excessively enlarged. Bleeding is an emergency which needs to be treated urgently because uncontrolled bleeding can be fatal. Signs of ‘Shock’ (in severe cases), with pale, sweaty skin, and breathing irregularities. Since the symptoms of Esophageal varices are noticeable only after the onset of bleeding of the affected veins, the condition can result in alarming low blood pressure because of loss of blood, and can lead to multiple organ damage. Endoscopy: to take a closer look at dilated veins and affected organs, and also to take tissue samples and treat bleeding. The line of treatment for Esophageal varices involves the use of medical procedures to stop bleeding, the use of beta blocker drugs, and even liver transplant (in rare cases). These tablets are prepared from a combination of potent herbs which have the ability to increase blood count, improve the quality of blood, treat anaemia, control cholesterol, decrease urea and creatinine levels, remove toxins from the body, and manage a number of other health conditions. 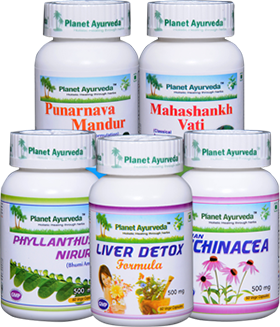 The herbal components of Punarnava Mandoor tablets include: Punarnava (Boerhaavia diffusa), Mandoor Bhasma (Ferric oxide calx), Amalaki (Emblica officinalis), Haritaki (Terminalia chebula), Shunti (Zingiber officinale), Pippali (Piper longum), Maricha (Piper nigrum), Haridra (Curcuma longa), Chavya (Piper chaba), Vidanga (Embelia ribes), and Chitrak Mool (Plumbago zeylanica). Dosage: 2 tablets two times daily, with plain water, after meals. Liver Detox capsules are an excellent herbal formulation that is helpful in managing several liver conditions which can be a major causative factor for Esophageal varices. The use of these capsules is beneficial in maintaining healthy functioning of the liver, cleansing and detoxifying the liver, promoting digestion, lowering cholesterol levels, and supporting overall good health by providing sufficient amounts of nutrients to the body. The herbal extracts used for preparing these capsules include: Punarnava (Boerhaavia diffusa), Haritaki (Terminalia chebula), Makoy (Solanum nigrum), Kasni (Cichorium intybus), Biranjasipha (Achillea millefolium), Himsra (Capparis spinosa), Katuki (Picrorhiza kurroa), Kalmegh (Andrographis paniculata), and Jhavuka (Tamarix gallica). All these herbs synergistically have proven properties for detoxification of the body, particularly detoxification of the liver. Dosage: 1- 2 capsules two times a day, with lukewarm water, half an hour after meals. The standardized herbal extract of the ‘Bhumi amla’ herb (Phyllanthus niruri) is used for the preparation of these capsules. The herb is known for its immense medicinal value, especially its diuretic, acrid, cooling, and alexipharmic properties. The use of these capsules is beneficial in improving the liver function, purifying the blood, boosting the immune system, and treating anaemia. The capsules are also useful in managing several gastrointestinal disorders, including hyperacidity, excessive thirst, constipation, and loss of appetite. Dosage: 1-2 capsules, twice daily, after meals. These capsules are prepared from the standardized extract of ‘Indian Echinacea’ herb (Kalmeghor Andrographis paniculata) which is widely used in Ayurvedic formulations. Indian Echinacea is considered an excellent herbal supplement because of its anti-parasitic, immuno-stimulant, antibiotic, anti-viral, and anti-inflammatory properties. The use of Indian Echinacea capsules is helpful in managing liver and kidney diseases. The capsules are recommended for the treatment of HIV and Hepatitis B, improving the functioning of the liver, cleansing the blood, managing gastric disorders, treating bowel problems, eliminating toxins from the body. Dosage: 1 - 2 capsules two times a day, with plain water, after meals. For preparing these tablets, a combination of powerful and well-known herbs is used, including Pippali (Piper longum),Danti (Baliospermum montanum), Chitraka (Plumbago zeylanica),Yavkshar (Potassium Carbonate), Sarjakshar (Sodium Carbonate), Shudh Tankan (Purified Sodium Biborate), and Shudh Parad (Purified Mercury). These herbs have proven antipyretic, appetizer, digestive, and analgesic properties. These tablets can balance the Vata, Pitta and Kapha doshas of the body, provide relief in gastritis, reduce intestinal pains, maintain the health of digestive organs, maintain the body metabolism, manage digestion-related ailments, improve appetite, and reduce inflammation. Planet Ayurveda's herbal formulations for managing Esophageal varices are prepared from 100% pure and natural herbs, without the use of any chemicals, artificial colours, additives, or preservatives.